Last Saturday I had the pleasure of dropping a guest mix for Darker Than Wax FM broadcasting out of The Lot Radio, in Brooklyn. It was a snowy Saturday morning but we still brought the solshine vibes! These guys have impeccable music taste, so it was such an honor, be sure to follow them on soundcloud..
Mawkus kicks off the mix, followed by guest DJ Liana Rose bringin those UK Grime beats. I join the 2nd half with music by Tuamie, Ronald Bruner Jr, Phony Ppl, D'Angelo, Abra, & more, and then Marcoweibel closes us out. Warm Up for Elements: Spring Edition with Nina Sol & Patrick Wilson! Hey y'all! I can't believe we have to wait until April 8th for the next ELEMENTS party, but trust me it will be worth the wait. We have some plans & schemes in motion and are very excited to be dancing into the wee hours at Tribe Oakland! In the meantime, here is recent soulful house mix to hold you over! ELEMENTS: Spring Edition @ TRIBE Oakland! "Where dancers and music lovers unite"
Introducing "Star Map Sessions" A New Quarterly Mix Series! 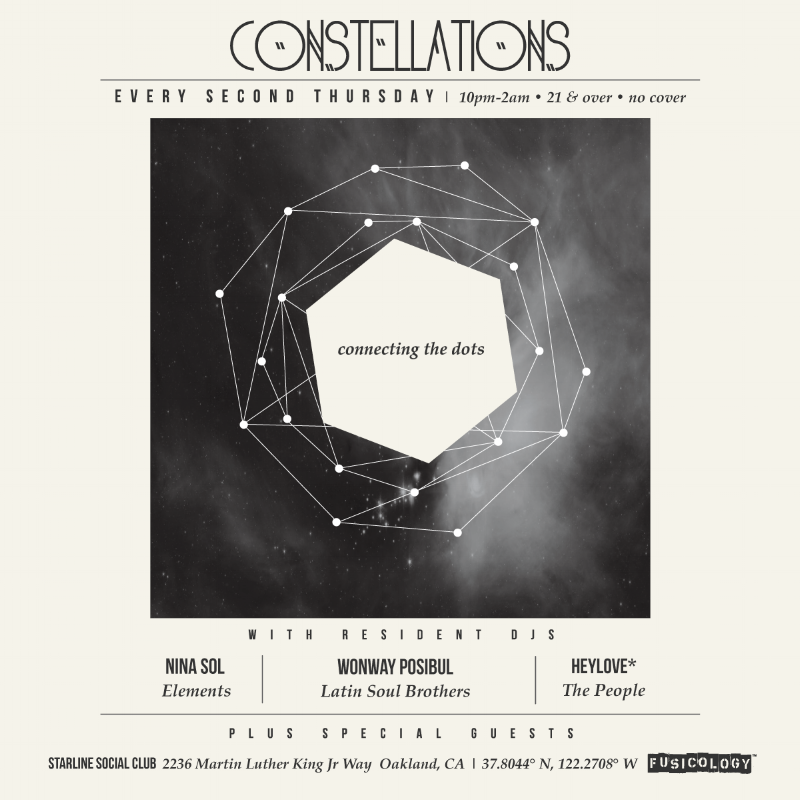 My patna's heyLove, Wonway and I have a new quarterly mix series based on our monthly #ConstellationsOAK party where we celebrate past & present artists born under the month's zodiac sign. We hella nerd out, so I'm very excited to share this with you! Jennifer Johns Azania Release Party on March 2nd! On Thursday, March 2nd, I am thrilled to join an incredible line-up of women artists for the welcome home party + Azania album release for my homegirl, the amazing, Jennifer Johns. Azania is an album recorded during Jen's travels in South Africa over the past year while on a mission to ask the question "What is Freedom"? The night will also include performances by Bay Area greats, Ryan Nicole & Viveca Hawkins + an all female band!?! I'll be spinning afro-tinged soulful things throughout the night. The event kicks off at 8PM at The New Parish. Tickets available HERE, Join Us!